Take time to read other information on this page that explains other details about drawer slides and other product information. Frameless cabinets do not have a face frame. The front edge of the cabinet sidewall is the front of the cabinet. When the doors and drawers are closed they cover almost the entire cabinet. The hinges are totally concealed when the doors are closed. Euro style hinges are larger than the traditional framed cabinet hinge and tend to interfere more with the cabinet opening. Frameless cabinets often use a 32mm hole system for the hinge mounting and shelf support. 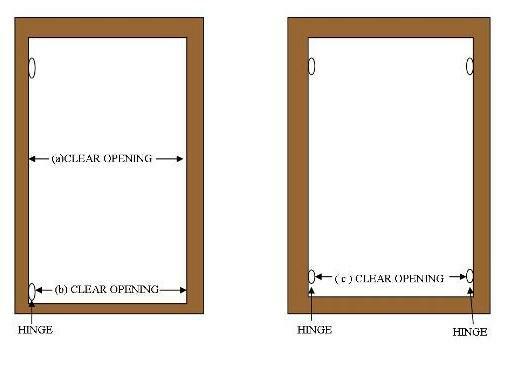 The interior width is the same as the opening minus the door and hinge interference. Many newer homes have frameless style cabinets. Frameless cabinets always have "sidemount" mounting style. Drawer Slide Sizes: Drawer slides are in even increments so if a 19” deep shelf is ordered then it will come with a 18” drawer slide, 21 with a 20” slide etc. Shelves are made 1" less than clear opening size to accommodate the drawer slides that according to drawer slide manufacturer specs must have a 1/2" allowance on either side. Do not take the allowance into consideration as we will at time of production. FULL SHELF OR BASE MOUNTING IS THE EASIEST METHOD OF INSTALLING SLIDE OUT SHELVES. WHEN YOU CHOOSE THE THIS OPTION THE GLIDE HARDWARE WILL HAVE FOUR L BRACKETS ATTACHED, TWO ON EACH GLIDE. THESE L BRACKETS ALLOW YOU TO ATTACH THE SLIDE OUT SHELF HARDWARE DIRECTLY TO THE CABINET BASE FOR THE BOTTOM SHELF OR ON TO AN EXISTING FULL DEPTH SHELF. NOT FOR FACELESS CABINETS.THE FULL SHELF INSTALLATION IS NOT ONLY THE EASIEST WAY TO INSTALL PULL OUT SHELVES, IT IS ALSO ONE OF THE STRONGEST INSTALLATIONS. MANY BASE KITCHEN AND BATHROOM CABINETS HAVE A SHORT "HALF" SHELF FOR THE UPPER SHELF. THIS SHELF IS USUALLY ABOUT 10" TO 12" DEEP. YOU CAN INSTALL A FULL DEPTH SLIDE OUT SHELF WHERE YOUR HALF SHELF IS. IF YOU CHOOSE THE HALF SHELF OPTION WE WILL SEND THE DRAWER GLIDES WITH AN L BRACKET ATTACHED NEAR THE REAR OF EACH GLIDE. THIS L BRACKET CAN BE SCREWED TO THE EXISTING HALF SHELF. THE FRONT OF THE GLIDES CAN BE ATTACHED TO THE CABINET FACE FRAME. REAR SOCKETS ARE NYLON OR (ZINC ON FULL EXTENSION BRACKETS) WHICH THE DRAWER GLIDE SLIPS INTO FOR ATTACHING THE GLIDE TO THE CABINET BACK .THE FRONT OF THE GLIDES CAN BE ATTACHED TO THE CABINET FACE FRAME, THEY CAN BE SIDE MOUNTED OR THEY CAN BE MOUNTED USING EUROSPACERS. REAR SOCKETS WILL NOT WORK WITH SHELVES OVER 22" DEEP . THERE ARE ALSO EURO SPACERS THAT CAN BE USED ON FRAMED OR FRAMELESS CABINETS.